The Master of Laws (M.L. or LL.M. ; Latin Magister Legum or Legum Magister) is a postgraduate academic degree, pursued by those either holding an undergraduate academic law degree, a professional law degree, or an undergraduate degree in a related subject. In some jurisdictions the "Master of Laws" is the basic professional degree for admission into legal practice. There are a wide range of LL.M. programs available worldwide, allowing students to focus on almost any area of the law. In Europe, LL.M. 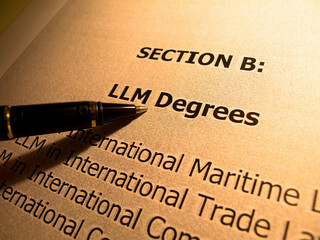 programs in European law are recently very popular, often referred to as LL.M. Eur (Master of European Law).